Eureka County Commissioners, members of the Planning Commission, Public Lands Commission, and county staff had the opportunity to tour the proposed nuclear waste facility at Yucca Mountain, Nevada. The county also invited Steve Frishman, a geologist with the Nevada Nuclear Waste Project Office, to provide the state’s perspective on the site characterization process taking place at Yucca Mountain. The Eureka County representatives visited the five-mile tunnel and witnessed various scientific tests being conducted on what is possibly the most studied geologic formation in the world. 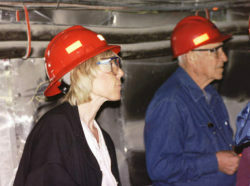 The tour group included Commissioners Donna Bailey, Pete Goicoechea, Wayne Robinson; Michael Mears, Ted Beutel, Hollen Moll, Ronald Damele, Dodi Moyle, Vicki Drenon, Ellen Rand, Leonard Fiorenzi, Abby Johnson, Ronald Rankin, Maxine Rebaleati, Jon Hutchings, and Kenneth Washburn. On the morning of April 30, the county delegation boarded a bus in Beatty and headed for Yucca Mountain via the Nevada Test Site. During the ride, DOE science engineer Patrick Rowe briefed the group on status of the repository project and concentrated on the history of the Nevada Test Site. To date, nearly $8 billion has already been spent scrutinizing the fault movements, sediment layers, and chemical content of the rock – yet many of the results are less than conclusive. Scientists working for the state of Nevada, such as Steve Frishman, contend that DOE has an insufficient understanding of the complexities of water movement through the mountain, one factor that will prove fundamental to the repository’s ability to contain the deadly waste for the 10,000-year regulatory period. Wearing hard hats, protective goggles and safety belts, the tour group boarded a mining train which transported them down into the mountain. Deep below the desert surface, DOE representatives demonstrated the thermal testing processes and explained the complex instruments measuring the rate of water flow through the mountain. Despite the uncertainty of the project’s fate, the officials optimistically fielded questions about earthquakes, volcanoes, and groundwater contamination. After the tour of the inside of the subsurface facilities and lunch, the delegates went up to the top of the mountain. The ridge of Yucca Mountains is 1,200 feet above sea level. Eureka delegates took in the view – hillsides filled with sage and wildflowers sweeping down to the sun-drenched desert floor below. In the distance were cinder cones of extinct volcanoes rising up among the desert hills. On the far horizon, the snow-capped peak of Mt. Whitney was visible. State representative Steve Frishman briefed the group on the state’s primary concerns about the project including earthquakes, volcanoes, water movement, and radiation containment. Rowe gestured toward the north, pointing out where the repository may expand if it reaches capacity. If President Bush’s energy plan moves successfully through Congress this year, more nuclear power plants could be on the way – inevitably generating more nuclear waste. According to Rowe, nuclear power has “an incredible future” in the United States. Its toxic byproducts, however, will have to be disposed of somewhere. Current law limits to 77,000 metric tons the amount of waste Yucca Mountain would be able to receive. On the trip back to Beatty, the bus stopped briefly at the site of MX missile test shelters – a vestige of a government project in the 1980s. The shelters serve as a reminder of another federally-initiated project that targeted Nevada, and was canceled. The fate of the Yucca Mountain project is yet to be determined. In July of 1999, the Department of Energy (DOE) released the Draft Environmental Impact Statement (EIS), a precursor to the Final EIS. However, the site characterization process has continued to evolve since then. Over the past two years DOE has been investigating various ways to further reduce the uncertainties in the long-term performance of the proposed waste facility. The evolution in the design of the repository that has taken place since 1999 has resulted in the need for a “supplement” to the impact statement. The Supplement to the Draft Environmental Impact Statement for a geologic repository at Yucca Mountain was released in May of this year, with the purpose of updating the information presented in the Draft EIS. As with the Draft EIS, public comments were also accepted on the Supplement. DOE initially allotted a 45-day comment period, ending June 25, 2001. The state and local governments requested an extension on the deadline and were granted an extra 10 days. Over 700 individuals and organizations, including Eureka County, were also granted an extension until August 13 because they did not receive their requested copies of the document until late June. DOE must take comments on the supplemental document into consideration when preparing the final impact statement. While the fundamental aspects of the repository design remain the same as those discussed in the Draft EIS, there are new additions that must be evaluated from an environmental impact standpoint. A new flexible design focuses on controlling the rock temperature by factors such as the spacing of waste canisters inside the repository. One option would heat the adjoining rock to temperatures above boiling during the 10,000-year regulatory period. Another would keep temperatures at about 185 degrees Fahrenheit or just below the boiling point. The potential impacts of the differing heat scenarios are analyzed in the document and compared to those assessed for the original repository design described in the Draft EIS. Two additional features have been added to the design. DOE has proposed both a blending pool – where thermally hot wastes would be mixed with cooler wastes before emplacement into the repository – and an above ground spent fuel storage area, where nuclear waste would be placed for a 50-year cooling off period. State officials and others have recommended that the waste remain at reactor sites for a similar length of time to reduce the dangers of transport and to allow time for consideration of other waste management strategies. State and local officials have also expressed concerns about elements of the new flexible design described in the supplementary impact statement. Primary among those concerns is the lack of one single agreed-upon repository design. Opponents of the project do not believe a set of evolving design scenarios with variable operational modes is a sufficient base on which to recommend the site. Critics have also pointed out the document’s failure to address the comments made on the Draft EIS. The Supplement does not attempt to analyze the inadequacies in DOE’s impact assessment, as pointed out by the comments of state and local governments and concerned citizens. Questions about the impacts of the transportation of high-level nuclear waste to Yucca Mountain remain unanswered. The socioeconomic impacts of the proposed repository for the surrounding communities are also inadequately addressed. According to state officials, “the Supplement does nothing to redress the deficiencies” inherent in the impact analysis of the Draft EIS. The information contained in Draft EIS and the Supplement will be incorporated into the Final Environmental Impact Statement, as mandated by the Nuclear Waste Policy Act of 1982. The document will be a fundamental part of a site recommendation and construction authorization. A thorough analysis of the potential environmental impacts of the repository is required support for the Secretary of Energy’s recommendation to the President. According to DOE, the Secretary’s final decision on the suitability of Yucca Mountain – currently the only site under consideration for a nuclear waste repository – is due sometime before the end of the year. Senate Power Shift: Will the Yucca Mountain Project be Affected? In an unprecedented shift in congressional power, the Democrats took control of the Senate in June when Vermont Senator James Jeffords left the Republican Party to become an independent. The Jeffords switch surprised Republicans and left the Democrats with a narrow 50-49 majority in the Senate. Nevada Senator Harry Reid, a vocal opponent of the Yucca Mountain Project and the second most powerful Democrat in the Senate, now holds the position of majority whip. According to new majority leader Tom Daschle, D-S.D., the positions he and Reid now hold in Congress “will allow us to put Nevada’s agenda on the national agenda.” This may have important consequences regarding one of the issues most important to Nevadans, the proposed waste facility at Yucca Mountain. Daschle went on to say that he believes “the Yucca Mountain issue is dead” as long as Democrats remain in the majority. As new chairman of the Senate’s energy and water subcommittee, Reid’s influence is already being felt. On July 12, he introduced a spending bill that would cut the budget for the Yucca Mountain project by 38 percent in 2002. The bill also contains $70 million for research into transmutation. Researchers are trying to use this process to shorten the lifetime of some long-lived radio nuclides. Yucca Mountain, located 90 miles northwest of Las Vegas, is the only site being considering for a nuclear waste repository. If the site meets the approval of the Secretary of Energy and the President, Congress would still have to override an expected veto by the state of Nevada in order to set the project in motion. In June the U.S. Environmental Protection Agency (EPA) set the final radiation standards for the proposed nuclear waste repository at Yucca Mountain, Nevada. The final standards, which are based upon a 10,000-year regulatory period, are nearly identical to the radiation exposure limits proposed by the EPA last year under the Clinton administration. A separate limit to protect groundwater flowing from the repository site is included in the new health and safety standards. Under the final EPA rule, the annual limit for radiation emitted from the repository would be 15 millirems. A separate 4 millirem standard has been stipulated for groundwater. A millirem is one-thousandth of a rem, the standard measurement of a radiation dose. For example, a chest x-ray exposes a person to about 5 millirems of radiation. According to the Department of Energy (DOE), the average person receives an annual dose of 360 millirems from natural sources, such as the sun, and exposure to residual fallout from atmospheric nuclear testing. The Nuclear Regulatory Commission (NRC),DOE, and nuclear industry officials exerted pressure on the EPA to set a less stringent standard and eliminate the separate groundwater protection provision. They claimed EPA was overstepping its bounds. 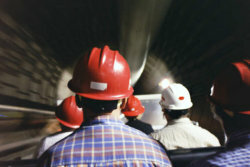 The NRC had proposed a less rigorous 25 millirem limit, however in May the Bush administration reaffirmed the EPA’s jurisdiction over the health and safety standards for Yucca Mountain. Under the Nuclear Waste Policy Act, the EPA has the clear authority for establishing the final rule. Government officials hope these standards are stringent enough to protect residents of the area, many of whom oppose the proposed repository, but not too strict as to derail the project entirely. According to EPA administrator Christine Whitman, the exposure limits will adequately protect the health and safety of residents: "These are strong standards, and they should be. We designed them to ensure that people living near this potential repository will be protected now and for future generations." However, the standards – which officially took effect July 13, 2001 – did not satisfy repository supporters or its many opponents. Lawsuits have been filed by the nuclear power industry, the State of Nevada, as well as various environmental groups opposed to the project. The Nuclear Energy Institute filed a lawsuit on behalf of the industry, charging that the EPA went too far in proposing a separate standard for groundwater. The industry argues that the radiation limits are too stringent and will cost taxpayers and electricity customers billions of dollars without making the proposed repository any safer. State officials and environmental groups, on the other hand, criticized the health and safety standards for being too lenient. On June 27, the state and a consortium of environmental organization filed separate suits challenging the radiation limits. The opposition’s main concern is that the 10,000-year period during which the regulations would be in effect is inadequate. According to scientists, radiation escaping from the repository will cause peak dosage to occur between the 200,000 and 800,000 year time period. State officials are also contesting the point at which the standards takes effect. The compliance boundary is now set at 11 miles from Yucca Mountain. Opponents believe that there should be no contamination outside the repository boundary, and that the standards should not rely on dilution and dispersion of radioactive materials instead of effective containment. The EPA ombudsman has also waded into the fray. Robert J. Martin, an independent investigator within the EPA, is often called in to referee disagreements between the agency and communities affected by its hazardous waste management programs. He has begun an initial inquiry and is inviting comment from state, local, and public oversight groups. The health and safety standards are fundamental to determining Yucca Mountain’s ultimate suitability as a site for a permanent nuclear waste repository. Secretary of Energy Spencer Abraham has stated that DOE will be able to meet EPA’s radiation standards. Abraham is expected to make the final site recommendation to the President sometime before the end of the year. In May, the Department of Energy (DOE) released a report detailing the progress of scientific studies for the proposed nuclear waste repository at Yucca Mountain, Nevada. The Yucca Mountain Science and Engineering Report is a summary of research completed for the site characterization process. The information in the report will be used to support the site recommendation, which is due sometime before the end of the year. The report further describes a new “flexible” repository design plan that has evolved significantly from the design originally presented in DOE’s Draft Environmental Impact Statement of 1999. 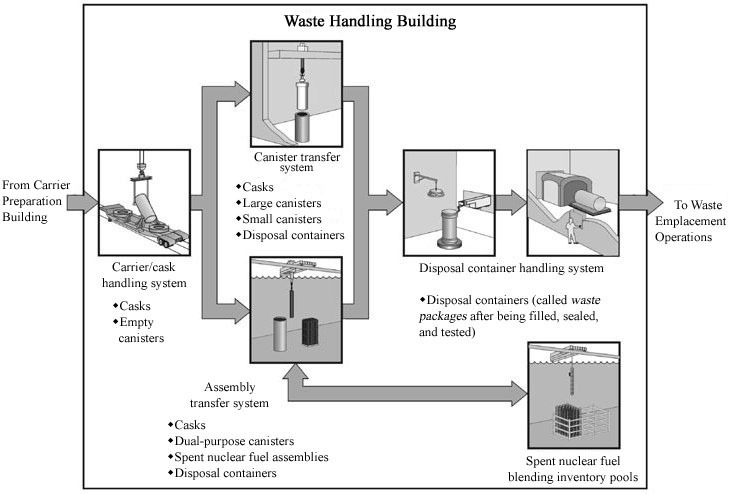 Based on a thermal management strategy, this flexible design evaluates different waste emplacement options that would allow variations in the temperature of the repository. For example, if the waste packages are placed closer together, the thermal energy generated would heat the surrounding rock to temperatures above boiling. The resulting steam might limit the amount of water that could contact the waste containers. In another option, temperatures would be kept well below boiling which would have less of an effect on the surrounding rock, reducing the complexities scientists face in predicting the future performance of the repository. Lower temperatures may also reduce the rate of canister corrosion. In this report, DOE chose to focus on the higher-temperature operating mode in more detail. The lower-temperature option is presented as a feasible variation in thermal management strategy. The potential impacts from this new flexible design scenario are evaluated in the recently published Supplement to the Yucca Mountain Draft Environmental Impact Statement. The supplement to the Draft EIS was also released in May of this year. The Yucca Mountain Science and Engineering Report also details the results of studies on water flow. Issues involving how water flows through the repository are significant given the many cracks and fractures found in Yucca Mountain. If water enters the repository, it could corrode the waste containers and carry radiation into the surrounding environment. 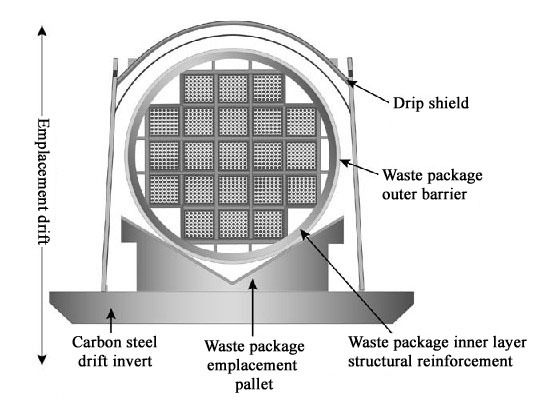 However, in the report DOE concludes that heat from the waste will drive water away from the metallic waste packages. With the addition of titanium drip shields, an extra barrier designed to further limit water contact, the waste packages are expected to remain intact during the “compliance” period of 10,000 years. It should be noted that while adding hundreds of titanium shields would increase development costs by billions of dollars, the waste packages will still eventually be breached, releasing radioactivity to the biosphere. According to the 1982 Nuclear Waste Policy Act, the Secretary of Energy must have a comprehensive scientific statement to use as the basis for any site recommendation. In part, the Secretary will use the information contained in this report to help determine whether to recommend Yucca Mountain to the President as a suitable site for a permanent repository. The site recommendation report is due before the end of the year. If both the Secretary of Energy and the President find the Yucca Mountain site suitable for a repository, the State of Nevada can file a protest. However, the state’s veto can be overridden if both the House and Senate pass resolutions approving the site. If ultimate approval is obtained, the repository could start receiving waste as early as 2010. The county is currently preparing an Impact Assessment Report to identify and quantify the potential impacts of nuclear waste transportation in Eureka County. The county plans to submit the report to the State of Nevada for inclusion with its Impact Report and to the Secretary of Energy for his consideration. The report also will provide present and future county commissioners with basic information on how the construction of a rail line in Crescent Valley could affect areas such as grazing, wildlife, flood control, and the county’s economy.